Hello? Is anybody there? Can anybody in the spirit world hear what I'm saying at this precise moment in time? Huh? What's that? You want me to shut my face whole, and just watch this 81 minute movie made in 1943? What? 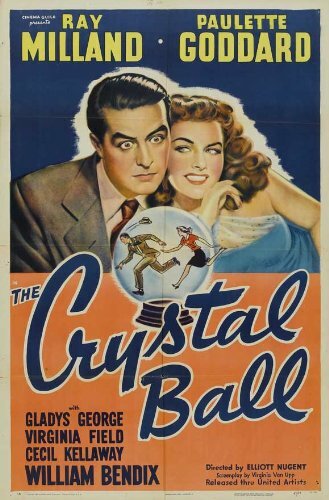 Do you mean this one Directed by: Elliott Nugent; and Starring: Ray Milland, Paulette Goddard, and Gladys George? Alright then. I will. Come in, Toni (Paulette Goddard). Please take a seat. For I am Madame Zenobia (Gladys George); and I'm going to explain to you how you're going to fall in love with that man standing across the street. No. I'm not talking about Biff (William Bendix), silly. I wouldn't wish that feller on anybody. Of course I'm referring to his boss instead. Brad Cavanaugh (Ray Milland). That dashing looking young lawyer who's currently tending to the business affairs of that blond tart I tricked only the other day, called Jo Ainsly (Virginia Field). Hey! Wait a minute! I just thought of something, Toni. Whilst your trying to while you're way into Brad's affections, you can pose as me! Not so long after I have an unforeseen -- KLANG! -- accident! Cause in this capacity, I have a strange inkling you two can get together without Jo being none the wiser. Saying that though, please remember, once he's finally in your grasp, for God sake; don't try to pretend that you're some sort of nursemaid living in a posh apartment downtown. Or otherwise that is why what next transpires will go nowhere fast! As a misunderstanding gets a slap - a clairvoyant cons a sap - a lawyer slips up on a raw deal - and at the end of the day two lovers eat a very expensive meal. 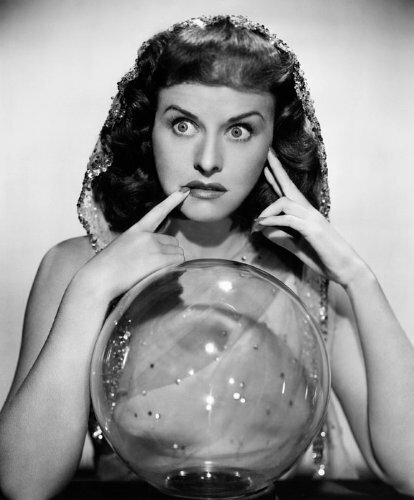 Whilst I'm sitting here, folks, thinking of something productive to write about 'The Crystal Ball', the only thing that really springs to mind is that stock expression you'll hear people say in all of those debonair and timely 50's movies... 'Peachy Keen'. Well, in a round about way this cheesy phrase kind of sums up this film to a tea. It looks good. It plays out well. All the characters had a zest to them that was rather fruitful by default. And overall, this flick is one hell of a smashing flick that I'd like to take a bite out of, again, and again, and again. Now from my own perspective, conceptually this tale is about a lady trying to catch the man of her dreams, by pretending to be some sort of con-artist / mystic. Granted. I know that this type of a narrative can come across as being a tad dated and repetitive on occasion. Yet, whilst saying that, I'm more than happy to declare that this movie manages to avoid this obvious pitfall, by telling a few jokes, spreading a little love, and garnishing the screen with an actor and an actress that somewhat resembles Cary Grant and Lucille Ball during there prime. Ah-huh! So now do you see what I mean by 'Peachy Keen', folks? As that's what this film is you know. To the nth degree. Allowing us -- the audience -- enough time to sit back, relax, and just enjoy what it has on offer. Furthermore, something else it also allows us to do is to appreciate a simple premise plus a well defined cast of characters, without worrying what's going to happen to them from one moment to the next. 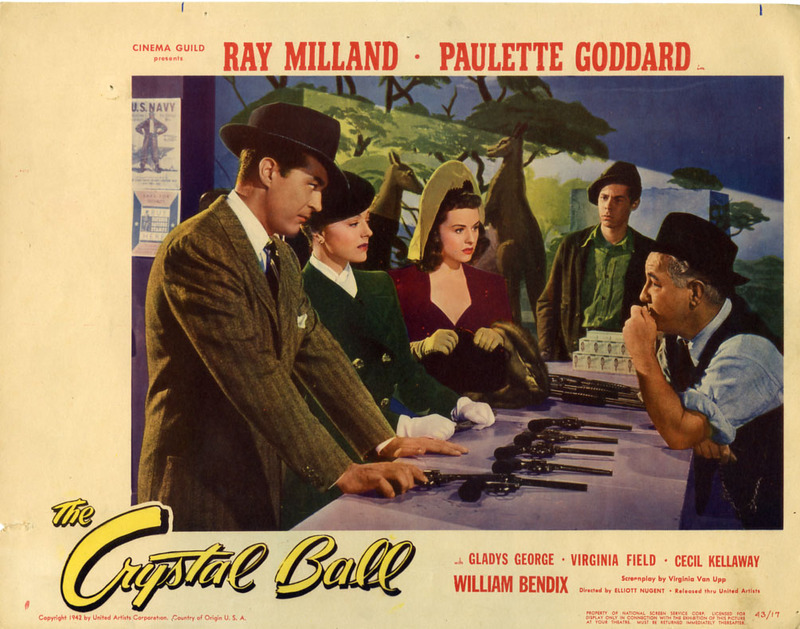 From the very start of this film you know that Paulette Goddard and Ray Milland are going to end up together sooner or later. And on top of that, you know that they will be able to overcome any of the obstacles barring there path too. Nonetheless. This doesn't matter within the scheme of things. It's the journey that matters, right? A fairly straight forward but well nourished journey that is both a pleasure and a wonder to witness at the very same time. Anyway. Before I praise this piece too much. Here. Check out these filmic-facts. (1) 'Paramount Pictures' first released this production on the same day Margaret Bourke-White became the first woman to ever accompany the 'US Army Air Force' on a bombing mission -- the 22nd of January, 1943. (2) Loosely translated, this project was entitled 'Him I Want' in Denmark; 'The Fortune Teller' in Spain; and 'The Redhead Goes Hunting' in Sweden. (3) The majority of this movie was shot at 'Paramount Studios', 5555 Melrose Avenue, Hollywood, Los Angeles, California. (4) The tune Paulette Goddard's character whistles at the beginning of this adventure, 'I've Got Spurs That Jingle, Jangle, Jingle', was a hit show-tune first introduced in another movie she starred in one year earlier, 'The Forest Rangers'. (5) Between 1942 and 1943, this was one of the few films 'Paramount' sold to 'United Artists' for them to then release theatrically. (6) Virginia Van Upp adapted the screenplay for this film from a story originally created by the Hungarian writer, Steven Vas. (7) Elliott Nugent, who directed this flick, also directed the 1949 version of the 'The Great Gatsby' starring Alan Ladd, amongst many-many more pictures from 1932 to 1952. 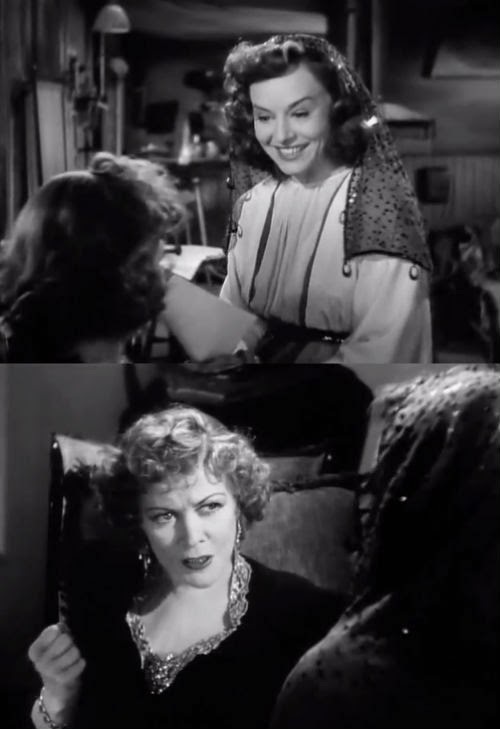 (8) After this movie was unleashed, Ray Milland starred in 'Lady in the Dark'; Paulette Goddard starred in 'Star Spangled Rhythm'; and Gladys George starred in 'The Hard Way'. 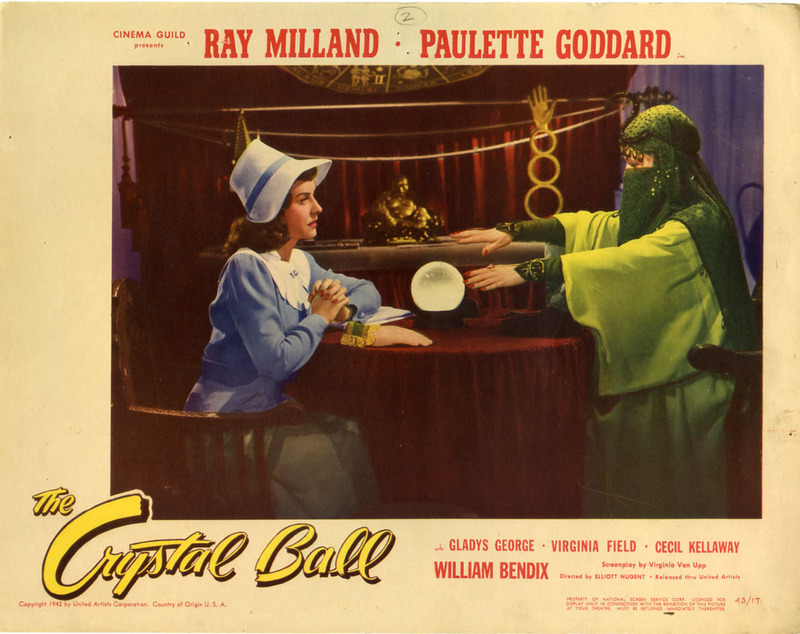 All in all 'The Crystal Ball' was very nice film to watch. The cast were all flavoursome. The story was full of spirit. And at the end of the day the overall production was just... ahem... 'Peachy Keen'.